Apple’s upcoming AirPower wireless charging pad will be released pretty soon, and it’s a pretty cool accessory. With just one pad you can charge your iPhone, Apple Watch, and AirPods as long as they’re in a special new case that supports wireless charging. Here’s the rub. First, the AirPower is going to cost $150. Second, you’ll have to pay extra for the new AirPods case. And third, do you really need to charge your AirPods wirelessly? 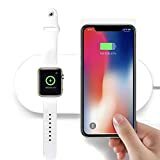 The Facever 2 in 1 Qi Wireless Charging Pad costs just $35 on Amazon and it can wirelessly charge your iPhone and Apple Watch at the same time. It doesn’t have a third coil, but let’s be honest… it doesn’t need one. AirPods need to be charged once a week at most, so just charge them while one of the coils is free. Portable: Portable charging station, just left down your enabled qi wireless charging devices, and it will start charged.